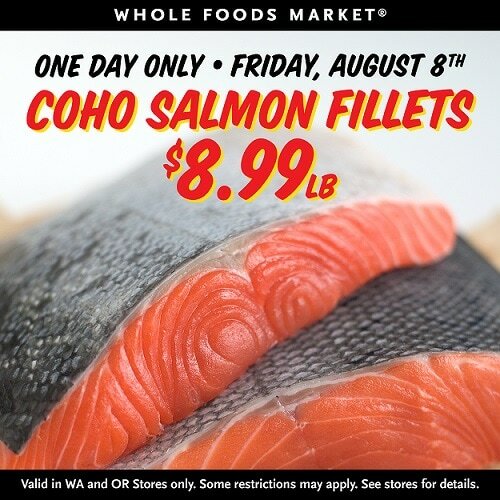 Whole Foods – One Day Sale On Wild-Caught Coho Salmon – $8.99/lb (Fri. 8/8)! Whole Foods is having a sale today on Alaska wild-caught Coho salmon today Friday, August 8 at your local Whole Foods Market stores. For this day only you’ll find this tasty fish available for US $8.99/lb! It’s the peak of wild salmon season! This Coho is fresh, never frozen, and rich in Omega-3s. Coho is full-flavored, flaky, moist and tender, making it a versatile and delicious choice for the grill, summer salads or hearty salmon burgers. The wild Alaska salmon Whole Foods Market selects are allowed to mature at their own pace by feeding on their natural diet in the icy cold waters of Alaska. This wild Alaska Coho salmon comes from fisheries rated green by the Monterey Bay Aquarium or Blue Ocean Institute. That signals healthy populations (no overfishing) and a fishing method that’s easy on the environment. Whole Foods Market has two dedicated port buyers, Keith Harris and Anthony Jordan, living in Alaska during the summer months who work directly with the fishermen on the docks to select the highest quality fish. Rosemary-Lime Wild Alaska Salmon Kabobs – perfect for summer grilling and entertaining!